When your SQL Server environment isn't running in optimal fashion, or you want to confirm best practice adherence, Dell Services can help. 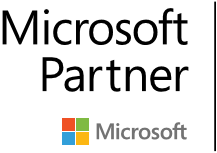 Dell consultants can review the latest features of SQL Server on-premise, Azure SQL, Power BI and APS to help you determine fit and migration planning. Enable an optimal data modernization strategy with Dell’s complete ecosystem of Services solutions. These Assessments, Jumpstarts and Health checks allow you to quickly demonstrate value with a new Microsoft BI related solution. 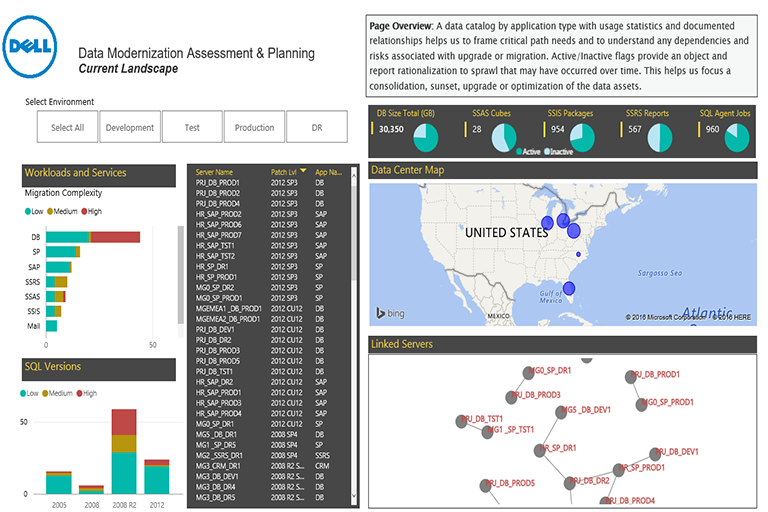 We review your BI landscape and provide a road-map that meets your future needs with data. 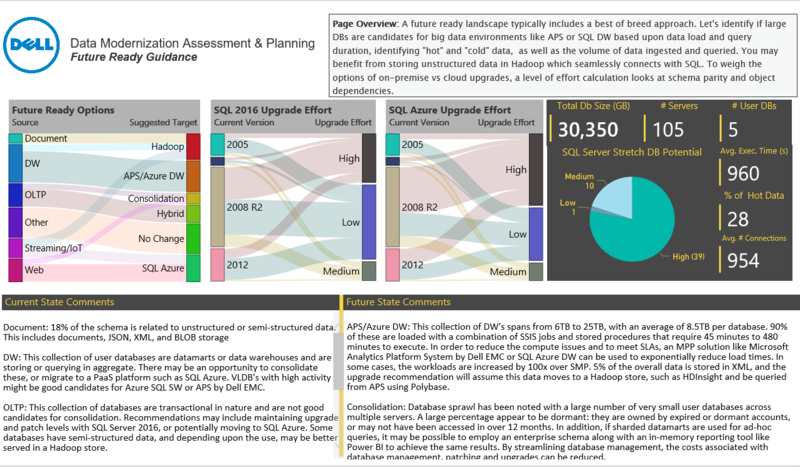 Dell consultants review the latest features of SQL Server on premise, Azure SQL, Power BI and APS to help you determine fit, understand upgrade options and rationalize a data environment that may have sprawled. The outcome – Understanding if your current landscape meets your future needs and best practice recommendations to get there. If your current SQL Server environment isn't running in optimal fashion, or you want to confirm best practice adherence, Dell SQL Server experts provide a diagnostic review of your database environment in order to identify potential performance optimizations. 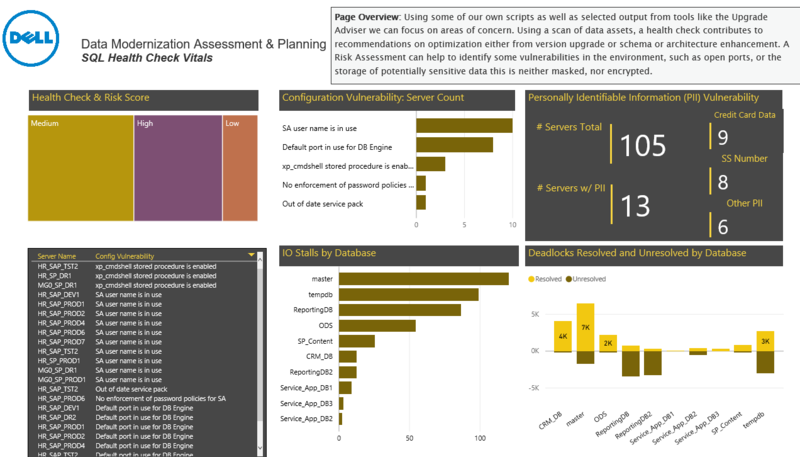 In addition, we offer a SQL Data Risk Assessment to identify entry points to sensitive data. The risk assessment results in a protection plan to harden SQL systems and mitigate data security issues. Do you need to migrate off a database version that is at end-of-life or end-of-support? Dell can help in this journey by providing reference architectures for data warehousing, elastic scale with Azure and implementation services. Embrace big data and innovation with the power of massively parallel processing (MPP) solutions, advanced analytics and modernized reporting visualizations delivered on premise and in the cloud. Comprehensive data and platform migration is available to help customers move from legacy platforms like Oracle. Consolidation helps rationalize the database environment for efficiency in cost and maintenance. Whether you need to convert, migrate and upgrade 25 instances or over 100, Dell has right-sized comprehensive offers that remove the gotchas and deliver consistent results.